Onion have designed the Bear House in Cha-Am beach, Thailand. 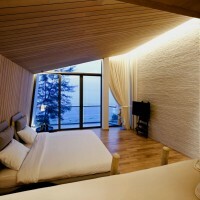 Bear House is on Cha-Am Beach, a famous seaside resort town in central Thailand, three hours drive from Bangkok. The brief is to renovate a three-storey building of eight metres wide and twenty-eight metres long, utilising an area of three-hundred and eighty square metres, turning it into a second home of the Sahawat family. 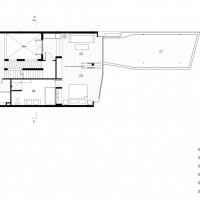 When the interior construction started, in December 2011, the boy of the family was two years old. A baby was expected. In April 2012, Bear House was happily finished. Bear House belongs to the Thai [email protected] collectors. Sittawat Sahawat and Nipapat Sahawat are siblings who are fascinated by various sizes and styles of [email protected] toys, produced by the Japanese company Medicom Toy Incorporated. [email protected] is an anthropomorphised bear with a simplified form and pot belly. Each plastic figure features nine parts, namely head, torso, hips, arms, hands and legs. It has flexible joints and a swivelled head. Many artists have created decorative patterns for the standard mould such as the British fashion designer Vivian Westwood and Stash who is considered one of New York’s graffiti legends. In the Sahawat family’s collection, the major figures are BAPE camouflage print. They are twenty-eight centimetres high and referred to as 400% [email protected] as its actual size, or a 100% [email protected], is seven centimetres high. Size matters in Bear House. The design process does not start from the house itself but the [email protected] display cabinet. 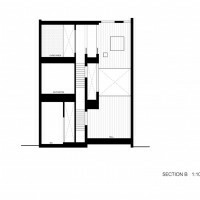 It is thought of as a house of seventeen 400% [email protected] It is composed of steps, ladders and voids that fit the scale of twenty-eight centimetres tall figures. 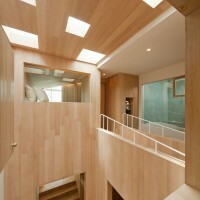 It occupies a whole wall of the dining room, linking the house’s entry to the living area which is three stories high. The cabinet is a central piece and a model of the house. 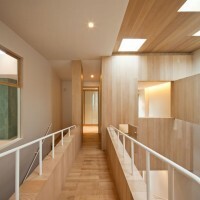 It is made of light coloured oak wooden panels resembling the other main surfaces of the house. Bear House is a bigger version of [email protected]’ display cabinet. Miniature fixtures and oversize furniture are the features of Bear House. Lamps and pillows are oversize so that the inhabitants may feel smaller than they actually are. The house has four sizes of doorknobs, customised for different size of doors. They are sometimes too big for a child’s hand and too small for an adult’s hand. The ladder that seems too high is one of the living area’s decorative elements. 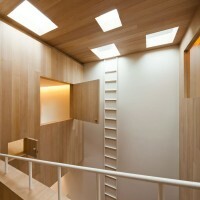 It leads the gaze high up to square skylights, oversize voids, and windows of different scale. 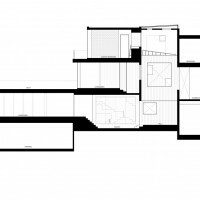 Every room on the upper floors overlook the hall of living area. 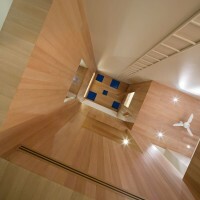 An enlarged [email protected]’s ladder is placed in the master bedroom. It connects a space between the king size bed and a single day bed in an elevated hole. There are two views from this day bed. Next to the hole is the three stories hall overlooking the living area. The opposite side across the room is the sea view. In front of the master bedroom stands a 1000% [email protected] of seventy centimetres high, painted in a pattern of police uniform. It is a special collaboration between French label Paul&Joe and Medicom Toy. 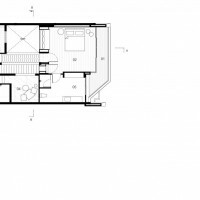 This 1000% [email protected] can be seen from the living area on the second floor, the bedroom on the second floor, and the landing that links the stair and the ramp towards the master bedroom. 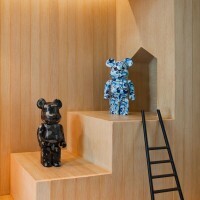 Bear House is bright and humorous. 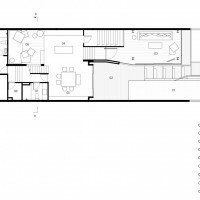 Its living room and swimming pool are the front part of the house. The whole space is coloured by young Thai graffiti artists well known as MMFK and P7. In the living room, behind the oversize sofa, MMFK paints a one-eye monster, dressed up as a sailor, whereas P7 paints a blue bear head with striped eyebrows. 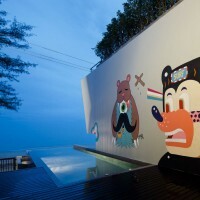 Next to the swimming pool, on the wall of eleven metres long, MMFK illustrates the cartoon representation of a bear devouring his iconic one-eye monster. P7 drew a black bear head with the word ‘surf’ on its forehead. These illustrations are customised only for Bear House.